Rene Benjamin was a French playwright and novelist best known for his novel Gaspard which he wrote while in hospital convalescing after an accident. The 3rd and 9th houses are good places for a writer as they are both concerned with communication, in the 3rd of information and the 9th of understanding. Benjamin had the Sun in Aries in the 9th opposite Uranus in the 3rd suggesting an innovative and original style of writing. He also had the Moon conjunct Neptune which is an excellent contact for imaginative artistic work of any kind but as it’s in Taurus in the 10th. house it shows a strong practical creative mind that would shape his career. 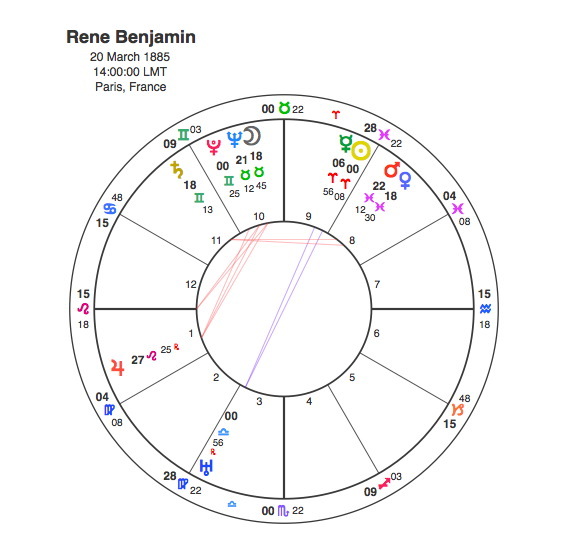 Accidents come under the rulership of Mars ( action ) and Uranus ( sudden disruption ) and Benjamin had the opposition between the Sun in Mars sign, Aries and Uranus in the 3rd house of movement showing someone who is inclined to be accident prone. Benjamin was hospitalized after an accident in 1914 and wrote Gaspard while he was there. He received the Priz Goncourt for the novel in 1915. Pluto created a T Square to the Sun and Uranus from 1913 – 15 and it was placed in the 12th house of hospitals at the time. Pluto’s only other major aspect was its conjunction with Benjamin’s Ascendant in 1948 when he died. Pluto triggered the accident that enabled Rene Benjamin to write his most successful novel. Perhaps it was no accident after all.